The First Nations of North America have contributed five well-known items of travel technology to the world: the canoe, toboggan, kayak, komatik, and snowshoes. Each was well suited for the harshness of the terrain and climate, and designed for swift and efficient travel over the land, water, ice and snow. Snowshoes are made primarily of birch, however, tamarack may also be used on occasion. The preferred lacing for snowshoes is caribou hide babiche, although sealskin, canvas, and rope have been used when caribou hide is in short supply. 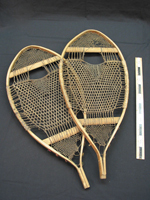 Men are normally responsible for making snowshoe frames while women do the lacing. In the past, some men were also able to lace snowshoes (for example, the late Shushepish Rich). An axe (ushtashku), crooked knife (mukutakan) and awl (tshishtaishaman/pakunaikan) are the main tools used to make the frames. Once carved into the appropriate shapes, the frames are soaked with boiling water prior to being bent. Women use two tools to lace the snowshoes – a netting needle called an amaku, and a lace straightener called a uetapitshaikanashku. During the lacing process, the frame will be secured firmly between the legs or between two poles stuck in the ground. Alika Podolinsky Webber, who conducted anthropological fieldwork among the Innu in the Davis Inlet area in the early 1960s, noted that it would take one day to make a pair of snowshoe frames, one day to dry the frames, and a third day for a woman to lace the snowshoes (Fieldnotes. 28 July 1960). In general, Labrador and Quebec Innu "preferred oval-shaped snowshoes with very short tails or no tail at all, styles that allowed them to manoeuvre in hilly, densely wooded and brush-filled terrain" (Time-Life Books, 1995:88). However, even in the barren, tundra area of the George River and Labrador plateau, oval-shaped snowshoes were still the preferred type. In the late 1800s, while conducting ethnographic fieldwork at Fort Chimo (Kuujjuaq) in Ungava Bay, Lucien M. Turner noted six types of snowshoes in use among the Mushuaunnuat (Barren Ground Innu). These included three types of single-bar bearpaw snowshoes, swallow-tail, beaver-tail, and wooden snowshoes. With respect to laced snowshoes, he observed that the "netting is made of deerskin [caribou], with the hair removed, and allowed to dry into a condition usually known as parchment. This is cut into strips of variable width, depending on the particular use for which it is wanted" (1894:146). A needle of bone, horn, or iron...is used for netting the snowshoes. The shape of the implement is flat and rounded at each point, to enable the needle to be used either backward or forward. The eye which carries the line is in the middle. Various sizes of needles are used for the different kinds of netting, of which the meshes differ greatly in size" (ibid.:146). William Duncan Strong, who conducted ethnographic fieldwork among the Mushuaunnuat in the Davis Inlet area in 1927-28, also recorded observations of Innu snowshoes and their manufacture. See VanStone (1985:15-19) for Strong's description of the manufacturing method. Several types were obtained by Strong and are now housed in the Field Museum of Natural History in Chicago, USA. Shimun: First, I have to look for a birch bark or tamarack tree to use for making snowshoes [the frames]. It usually takes me three days to look for the right kind of tree. I start by making the frames. I soak them in hot water and bend them into a round/circular shape. I make both ends meet, then I use a strong string to tie them together at the ends. Because of the lacing going around your foot, the snowshoe cannot come off. The only time it can come off is when it breaks. You do not step on the middle crossbar that goes across the upper part of the snowshoe. The mouth of a snowshoe is where you put in your foot and it is where the lace-strap is attached. There are different colours of wool that can be used for decorating a snowshoe. At the top of the frames, holes are made to put the wool through it. Some Innu decorate their snowshoes because they are proud of them. Also, there are different styles of snowshoes. In other Innu communities, some of the caribou hide is darker because the blood on the caribou hide was not well scraped off. There are other names for snowshoes too. The beaver tail shaped snowshoe is used for working outdoors during the winter, for getting firewood, checking your trap line and going far pulling a toboggan. It is the men's job to make snowshoe frames, and women's job to lace and decorate them. I learned how to make snowshoe frames from an Elder, Mishen Pasteen. It took me a week to make one. At first, I did not know how to measure the frames, how big I wanted them. Then on the third day, I did all that he taught me, and when I went to see him, he told me to use my fingers to measure. I did that, and finally I got it right. Today, we still do all types of snowshoes. We sell them to anyone who wants to buy them. We also make small snowshoes for decorating; hanging on walls. They make nice house decorations. There is a lot of work in preparing a snowshoe because of the caribou hide. Also, a caribou hide has to be prepared and cut into laces. Manian: Caribou hide is the best to use for lacing snowshoes. Moose hide is not resistant. It does not last like caribou hide. Also, sealskin is also good for lacing. The skin is cleaned and scraped really well. The fat on the skin is scraped off with an ulu. It is not slippery after it has been well scraped and it also lasts. If none of these hides are available, you can always use canvas. You tear it up in strips, but it is only good for making the bear paw shaped snowshoes. After you have finished the snowshoes, you hang them on a tree near your tent early in the morning. The animal masters would then feel sorry and help you get a caribou. The following names of snowshoes are still being researched. We provide the names provided by Elders (as written by the translators) for each snowshoe even though they do not always agree. When possible, we have tried to write the names in standard Innu spelling using Marguerite MacKenzie's Shoebox dictionary (noted with a single *), and Lynn Drapeau's Dictionnaire montagnaise-français (noted with a double **). Shakuasham or shetuasham – Etuat Mestenapeo, Natuashish. Interview 20 March 2003 by Peter Armitage & Tamien Benuen. Ushetu ashamits – Shuashem Nui, Natuashish. Interview 21 March 2003 by Peter Armitage & Tamien Benuen. Ushetusam - Alika Podolinsky Webber fieldnotes 12 July1960. Kautapashuts - Etuat Mestenapeo, Natuashish. Interview 20 March 2003 by Peter Armitage & Tamien Benuen. Kautapishuts ashamits - Shuashem Nui, Natuashish. Interview 21 March 2003 by Peter Armitage & Tamien Benuen. Kautapeshut - Alika Podolinsky Webber fieldnotes. 15 July 1960. Diagram of six types of snowshoes. Mukutu-ashamat – Akuanutin Nutshimiu-aimun . Sept-Iles: Centre de formation Nutshimiu atusseun, p.52. Shimun & Manian (Ashini) Michel also use this term for beaver-tail snowshoe (interview October-November 2002). "The beaver-tail shaped snowshoe is used for working outdoors during the winter, for getting firewood, checking your trap line and going far pulling a toboggan." (Shimun & Manian (Ashini) Michel interview, October-November 2002). Papatshituk-asham - Etuat Mestenapeo, Natuashish. Interview 20 March 2003 by Peter Armitage & Tamien Benuen. Papatshitaku-ashamat - Akuanutin Nutshimiu-aimun . Sept-Iles: Centre de formation Nutshimiu atusseun, p.52. Mishtiku-ashamat – Shushem Nui, Natuashish. Interview 21 March 2003 by Peter Armitage & Tamien Benuen. "It has to be a thin, flat and stiff board. There are no cross bars, no decorations. There is a hole at the forehead and this is left open. Not webbed" (Etuat Mestenapeo interview, 20 March 2003). "I remember these kinds of snowshoes. I wore them from Kameshtashtan. My father made them for me" (Tamien Benuen, during Etuat Mestenapeo interview, 20 March 2003). "I collected two peculiar pairs of snowshoes, made of flat spruce boards….They are shaped exactly like netted snowshoes of the ��beaver tail' pattern, and the arrangement of the foot strap is the same as usual. They came from the Little Whale river Indians, who informed me that they were worn on soft snow. In the spring of the year, when the snow is rapidly melted by sun, the netted snowshoes become clogged with slush, rendering the weight very fatiguing. Wooden snowshoes are admirably adapted for that season of the year, and may be made in a few hours, while the netted ones require several days' assiduous labor" (Turner, 1894 :148). Makutumits - Shuashem Nui, Natuashish. Interview 21 March 2003 by Peter Armitage & Tamien Benuen. Makutum - Alika Podolinsky Webber fieldnotes. 15 July 1960. Diagram of six types of snowshoes. Maahkutum – modified bear-paw snowshoe (Naskapi Lexicon). Uiueseusham - Etuat Mestenapeo, Natuashish. Interview 20 March 2003 by Peter Armitage & Tamien Benuen. Uikuesseu ashamits - Shuashem Nui, Natuashish. Interview 21 March 2003 by Peter Armitage & Tamien Benuen. Weeueseusem - Alika Podolinsky Webber fieldnotes. 15 July 1960. Diagram of six types of snowshoes. Uikuetshisseu-ashamat - Akuanutin Nutshimiu-aimun . Sept-Iles: Centre de formation Nutshimiu atusseun, p.52. "Women seem to prefer the uiuesueuasham . They can also wear the other kinds. Kids usually wear the bear paw snowshoes. If you need snowshoes right away, you can make these very quickly. Just use any old line" (Etuat Mestenapeo interview, 20 March 2003)." Maskushamits - Shuashem Nui, Natuashish. Interview 21 March 2003 by Peter Armitage & Tamien Benuen. Mushk asham - Etuat Mestenapeo, Natuashish. Interview 20 March 2003 by Peter Armitage & Tamien Benuen. Miskusam - Alika Podolinsky Webber fieldnotes. 15 July 1960. Diagram of six types of snowshoes. Mashku-ashamat - Akuanutin Nutshimiu-aimun . Sept-Iles: Centre de formation Nutshimiu atusseun, p.52. "Mashkushamish (little bear paw shoes) are usually made for little kids and in desperate times. If you need snowshoes right away. There is one frame across [has one crossbar], the upper part is called the forehead and that is left open. The latter part is webbed" (Etuat Mestenapeo interview, 20 March 2003). Shakushamits – Shuashem Nui, Natuashish. Interview 21 March 2003 by Peter Armitage & Tamien Benuen. Sagusam - Alika Podolinsky Webber fieldnotes. 15 July 1960. Diagram of six types of snowshoes. "These are the kind of snowshoes my parents used to make for me when I was younger….Anybody can wear them. Men, women, and kids" (Etuat Mestenapeo interview, 20 March 2003). "This type of snowshoe was used for travelling far" (Shimun & Manian (Ashini) Michel interview, October-November 2002). Drapeau and MacKenzie list ushuiak u as "queue de porc-épic" (porcupine tail), and ushuiakusham as "raquette <<queue de porc-épic>>." *not discussed by Etuat Mestenapeo and Shuashem Nui. Drapeau, Lynn. 1999. Dictionnaire montagnais-français . Quebec: Presses de l'Université du Québec. Lévesque, Carole. 1976. La culture matérielle des Indiens du Québec: une étude de raquettes, moccasins et toboggans . Ottawa: National Museums of Canada. Canadian Ethnology Service Paper No.33. MacKenzie, Marguerite. 2003. Shoebox dictionary. Sheshatshiu and Davis Inlet Innu-aimun. Unpublished draft computer database. Nutshimiu-atusseun. nd. Akuanutin Nutshimiu-aimun . Sept-Iles: Centre de formation Nutshimiu Atusseun. Time-Life Books. 1995. Hunters of the Northern Forest . Alexandria, Virginia: Time-Life Books. Turner, Lucien M. 1894 . Indians and Eskimos in the Quebec-Labrador Peninsula. Ethnology of the Ungava District . Quebec: Presses Coméditex. VanStone, James W. 1985. Material Culture of the Davis Inlet and Barren Ground Naskapi: the William Duncan Strong Collection. Chicago: Field Museum of Natural History. Publication 1358.